At long last, we’re here: Books IX and X bring the Fall and its aftermath to Paradise. Let’s get to it, shall we? Satan having compast the Earth, with meditated guile returns as a mist by Night into Paradise, enters into the Serpent sleeping. Adam and Eve in the Morning go forth to their labours, which Eve proposes to divide in several places, each labouring apart: Adam consents not, alleging the danger, lest that Enemy, of whom they were forewarn’d, should attempt her found alone: Eve loath to be thought not circumspect or firm enough, urges her going apart, the rather desirous to make trial of her strength; Adam at last yields: The Serpent finds her alone; his subtle approach, first gazing, then speaking, with much flattery extolling Eve above all other Creatures. Eve wondering to hear the Serpent speak, asks how he attain’d to human speech and such understanding not till now; the Serpent answers, that by tasting of a certain Tree in the Garden he attain’d both to Speech and Reason, till then void of both: Eve requires him to bring her to that Tree, and finds it to be the Tree of Knowledge forbidden: The Serpent now grown bolder, with many wiles and arguments induces her at length to eat; she pleas’d with the taste deliberates a while whether to impart thereof to Adam or not, at last brings him of the Fruit, relates what persuaded her to eat thereof: Adam at first amaz’d, but perceiving her lost, resolves through vehemence of love to perish with her; and extenuating the trespass, eats also of the Fruit: The Effects thereof in them both; they seek to cover their nakedness; then fall to variance and accusation of one another. Man’s transgression known, the Guardian Angels forsake Paradise, and return up to Heaven to approve their vigilance, and are approv’d, God declaring that The entrance ofSatan could not be by them prevented. He sends his Son to judge the Transgressors, who descends and gives Sentence accordingly; then in pity clothes them both, and reascends.Sin and Death sitting till then at the Gates of Hell, by wondrous sympathy feeling the success of Satan in this new World, and the sin by Man there committed, resolve to sit no longer confin’d in Hell, but to follow Satan their Sire up to the place of Man: To make the way easier from Hell to this World to and fro, they pave a broad Highway or Bridge over Chaos, according to the Track that Satan first made; then preparing for Earth, they meet him proud of his success returning to Hell; their mutual gratulation. Satan arrives at Pandemonium, in full of assembly relates with boasting his success against Man; instead of applause is entertained with a general hiss by all his audience, transform’d with himself also suddenly into Serpents, according to his doom giv’n in Paradise; then deluded with a show of the forbidden Tree springing up before them, they greedily reaching to take of the Fruit, chew dust and bitter ashes. The proceedings of Sin and Death; God foretells the final Victory of his Son over them, and the renewing of all things; but for the present commands his Angels to make several alterations in the Heavens and Elements. Adam more and more perceiving his fall’n condition heavily bewailes, rejects the condolement of Eve; she persists and at length appeases him: then to evade the Curse likely to fall on their Offspring, proposes to Adam violent ways which he approves not, but conceiving better hope, puts her in mind of the late Promise made them, that her Seed should be reveng’d on the Serpent, and exhorts her with him to seek Peace of the offended Deity, by repentance and supplication. Out of thousands of things to talk about, I’ve picked three passages from Books IX and X. I’d love to talk about every passage that’s provoked marginalia, but I require food and sleep and interaction with other humans. Rose up a fountain by the Tree of Life. For an epic poem, Paradise Lost is often concerned with the domestic; Eve and Adam are, after all, gardeners. We see them at home and in their ordinary daily pursuits, and with this simile, Milton reaches out to the ever-growing number of city dwellers in his own era, comparing Satan’s pleasure at Eve’s beauty (and the beauty of her handiwork) with the simple pleasures of getting out of town. It’s my favorite incursion of “modernity” in the poem. I’ve said before that we can read Paradise Lost as an example of eco-poetry, and this is just one instance of the way Milton values the rural, the natural, over artificial constructs. Later, after Eve and Adam eat of the forbidden fruit, he writes that “Earth felt the wound,” comparing the pain nature itself experiences at the Fall to the pains of labor and birth. The return of the poem’s creepiest character: Sin and Death create a path from Hell to Earth, and Death vows to follow in his mother’s steps. The savor of death from all things there that live. Be wanting but afford thee equal aid. Gah! I wrote about Yeats’s “The Second Coming” as the scariest poem in English last Halloween, and there’s no way that Milton’s death wasn’t an inspiration for the creature slouching toward Bethlehem. Yeats’s creature is a “shape”; Milton’s Death is a “feature” with one “nostril wide.” And snuffing? Nazgûl-like, if you ask me. And P.S., fellow Tolkien fans: there’s a simile in Book IX that’s a dead ringer for the Dead Marshes. 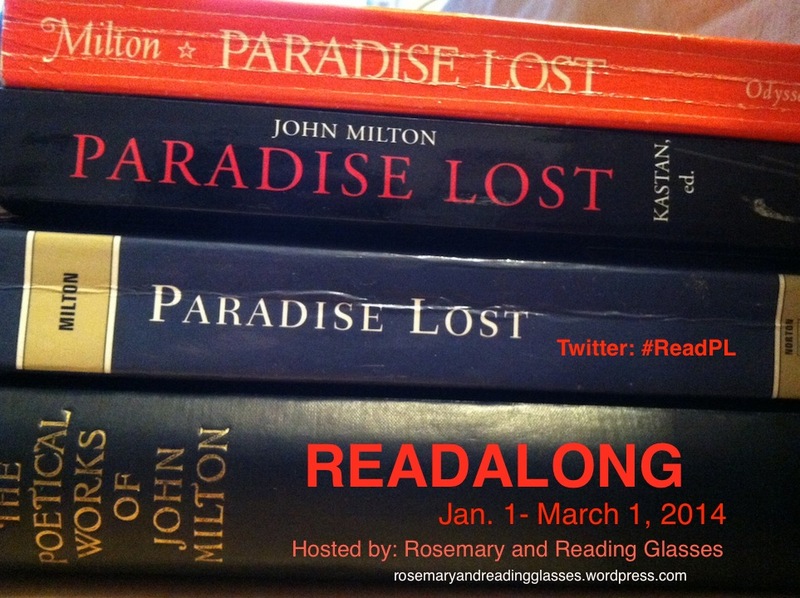 As if you needed any more incentive to read Paradise Lost. March 1: The bitter end — wrapping up with Books XI and XII. This is awesome, Carolyn! I love how you explained the meaning of “involve,” and I can totally see you lugging around an OED all the time! So cool. And the insights about eco-poetry and the domesticity/gardening of Adam and Eve was wonderful. You made me feel like I was lucky enough to be studying literature again. Thank you so much, Emily! 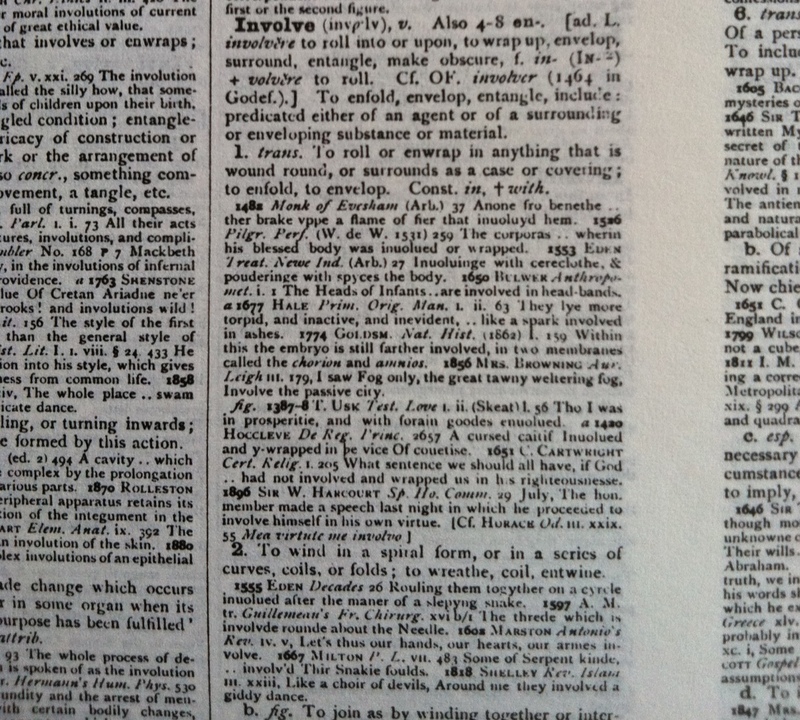 The OED was a gift from my dad. It’s two volumes and it really is as heavy as H. It sits on my desk. Each volume has a plastic slider beneath it, because otherwise they’d be impossible to pull from their box! I know, isn’t it awful! And it must be doubly difficult for believers like Milton, too, who see not only the aesthetic loss but the loss in terms of sin and the fallen nature of humankind.